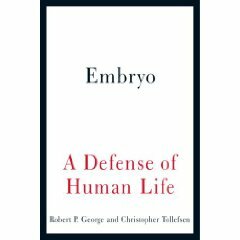 NOTICE: Several people have requested that we use the book Embryo: A Defense of Human Life by Robert P. George and Christopher Tollefsen for our Pro-Life Academy. Beginning with the first week of March, we’ll tackle the book at the rate of one chapter per week. I’ll have some bioethicists available for discussions on the threads. So, in roughly three weeks, we’ll begin to tackle Embryo. I hope that gives everyone time to purchase a copy of the book. On Thursday, we’ll pick up our continued treatment of embryogenesis. Unfortunately, Some events have arisen that have kept me from getting these lessons together in a more timely manner. We’ll pick it up on Thursday.